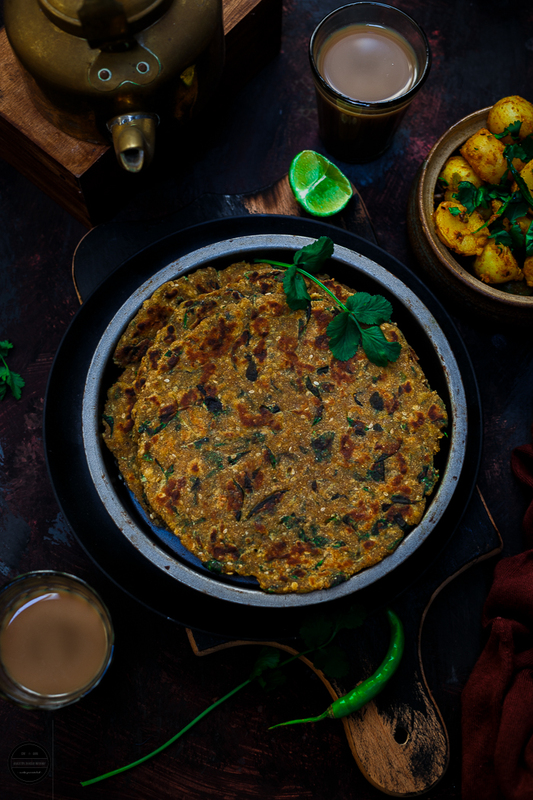 Methi Dhebra or Thepla, A delicious classic Gujarati flatbread prepared with fresh fenugreek leaves, multigrain flour and basic spices. It pairs well with dry potato sabji, yogurt, pickle or tea. Typical Bollywood pairs that go together like SRK and Kajol, some dishes go together. This makes a Kamaal Kombination ( combination)!! 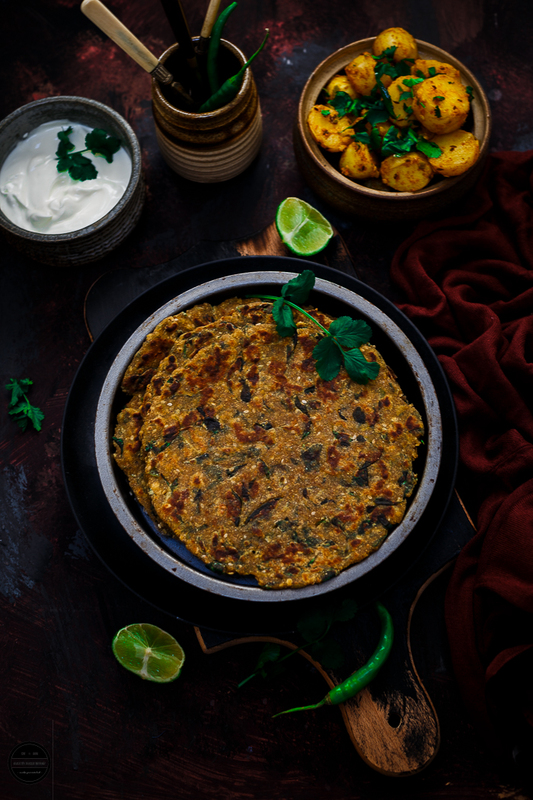 Such is the e.g of Methi Dhebra and Sukhi Bhaji(Fenugreek leaves Paratha and dry potatoes). This sort of K2 dishes are always a hit with my family members...I make them in a typical Gujarati Kathiywadi style. Ingredients include multi-grain flours, Yogurt and sugar, using yoghurt keeps the dhebras shelf life for longer...great for taking on holidays or picnic. So, let's see how I make Kathiyawadi Methi Dhebra? In Kathiyawadi food, garlic, onion and oil are heavily used and along with the garlic and onion sugar or jaggery is added too. 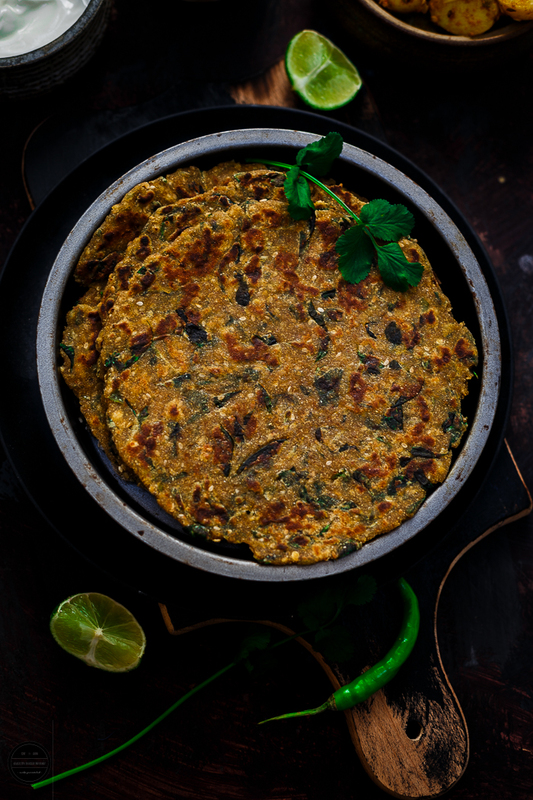 In Kathiawar Methi Dhebra or thepla made with garlic and sugar. In a one bowl mix yogurt and sugar or jaggery. Mix all the ingredients +2 Tbsp. oil and pile a dough like a chappati dough using water little by little. Leave it aside for half an hour. Divide the dough into equal size balls. Roll out the ball on a flat surface in dry flour and make a round paratha. Shallow fry on a hot griddle or tava till both sides are equally golden brown. Serve hot with potato dry bhaji, pickle and yoghurt. Heat oil in a heavy bottom pan, splutter cumin seeds, now add hing, green chillies and curry leaves. fry for few seconds and add potatoes and all the other ingredients and mix well..cook for 3-4 minutes on a low heat and it's ready to serve. Sending straight to The Combo Event event hosted by Pari. THINK SPICE-THINK AMCHOOR event hosted by Bhagyashri and started by Sunita ..to Bitter Better Health event hosted by Yasmeen..and Family's Faviourte Food-Valentine day event hosted by Shama Nagrajan. Look out for my next post where I'll be sharing awards !! This is indeed a great combination. Thanks for the entry! I can see why they're always a hit! Wow!! Sounds terrific and looks so yummy!! this is a wonderful combo...i love methi parathas..yumm! WOW Lovely combo... nice step by step pics... I love methi parathas and this looks yummy. yummy one dear, looks a great combo. Thanks for ur holi wishes, hope u had a good time too. What a lovely combo. Looks delicious and tempting. Thats a catchy name and indeed a wonderful combination! looks yumm! Definitely a perfect combo like SRK and Kajol ;) infact those mistakes are more appreciable with such wonderful dishes to feast!!! Roti and sabji sounds really interesting and prefect, adding amchur powder would have give tanginess to the sabji na...delicious combo!! Jag, Jag, what a combo..Hit hit soniye? I'll be hosting the home remedies event this month Jag, do send some entries OK? Wonderful combo! i absolutely love Dhebra! so delicious! I was going through my followers list and I saw that I have a silent follower. You! So I decided to check it out. Man I wish I had been here sooner cause you have a scrumptious spread in your space. Love the deliberately erroneous name and the combo! They looks yummy yum! It's a kool kombination! Sometimes I love typos when I'm in a weird mood. Oh well, methi dhabra and sukhi bhaji is tempting! Delicious kombo..Mouthwatering pics. Will add yogurt when I make methi parathas next. great entries for the event.looks very nice. 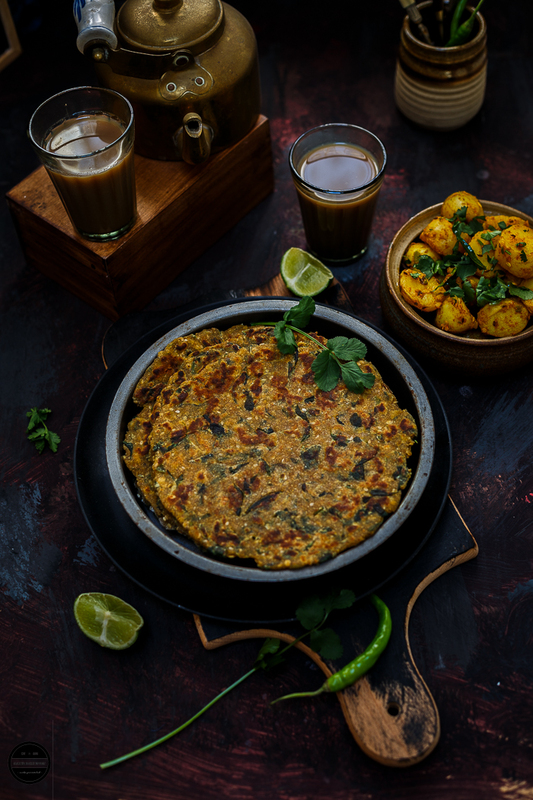 I love making methi thepla but adding millet flour was something i was not aware of. Makes it more healthy. Next time I make it i will try it this way.